If you get most of your produce from the grocery store, you may be short-changing your nutrition when you skip the freezer cases. Frozen produce can be equal, or superior, in terms of nutrient value, quality, shelf-life and cost. Fresh-picked vegetables and fruits straight from the farm or your own garden are of the highest quality, but when you're shopping at the supermarket -- choose a mix of fresh and frozen to maximize your nutrition intake. Produce selected for freezing is harvested when it's at its most ripe stage, rather than harvested early and allowed to ripen during transport to the market. When ripe, vegetables and fruits provide the most nutrition, Dr. Gene Lester of the USDA Agricultural Research Center in Weslaco, Texas told "Eating Well." Shortly after being picked, fruits and vegetables start to lose moisture, become susceptible to spoilage and decline in nutrient value. The "fresh" produce you get at a grocery store was likely picked or pulled from the ground several days, or even weeks, ago. Store it in your fridge for another few days, and you've got vegetables and fruits that have a lot of lost nutrients. For the most part, the majority of a vegetable's original nutritional value remains intact during the freezing process. Certain vitamins, though, will be negatively affected by the blanching process, which is the first step of freezing most vegetables. Manufacturers put cut up vegetables in hot water to seal in their color and kill harmful bacteria. Vitamins C and B do break down when exposed to this heat, so frozen vegetables are not ideal sources of these water-soluble nutrients. Long-term storage can also cause vitamin C to degrade, though, so eat fresh produce quickly after purchase to get the most C. Certain antioxidants may also be affected by freezing -- but not in all vegetables. Fresh green beans, for example, have more beta-carotene than frozen, but frozen peas have more beta-carotene than fresh varieties. Frozen produce remains nutritionally intact for about one year -- after that, vitamins and other nutrients start to degrade rapidly. Fruits are not typically blanched before being frozen, so fresh and frozen varieties are usually equally healthy. Both fresh and frozen blueberries, for example, have nearly equal health benefits. Some fruits, such as peaches, must be peeled before being frozen which may lower the fiber and phytonutrient content. Frozen fruits sometimes contain added sugar, which means they won't be as healthy as their unadulterated, fresh counterparts. 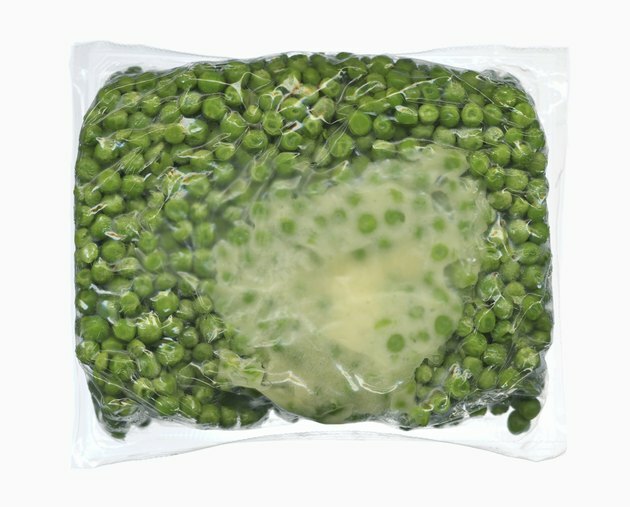 Some frozen vegetables, particularly those with sauces, also contain unhealthy additions such as sodium, fat and preservatives. Avoid boiling fresh or frozen produce, which further reduces the nutrient value of these foods; choose steaming instead. When you do opt for frozen, cook it straight from the freezer. A study published in a 2000 edition of "Die Nahrung" found that thawing vegetables, particularly spinach, okra and green beans, before cooking led to greater vitamin C loss. Steaming frozen vegetables in a small amount of water in a stainless steel pan leads to the greatest preservation of vitamin C.